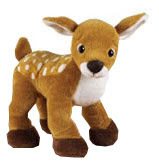 The webkinz deer is one sweetie pie with so much love to give you. If you are having a bad day, this deer will cheer you up. This webkinz loves to hangout at the clubhouse and watching TV. What a happy one. Brand new to the webkinz gang and so adorable. Special item: great outdoors window. Special food: buck potluck.